September 12, 2003, L. G. Crabo. 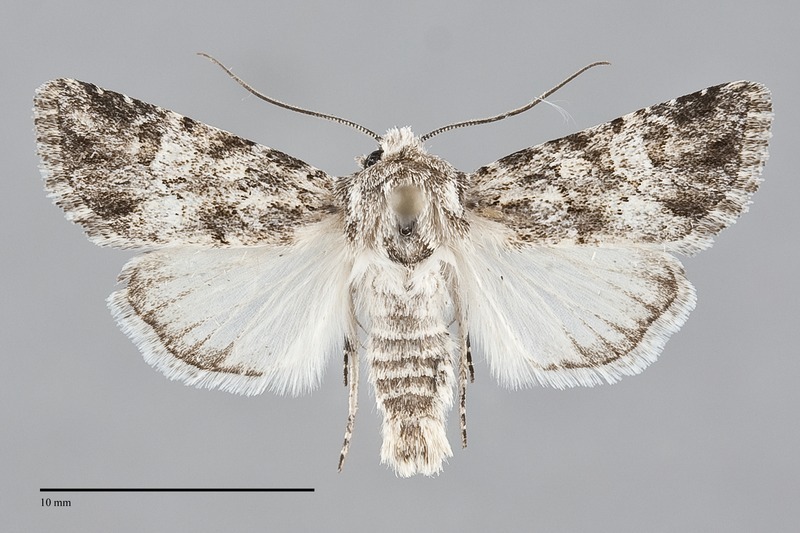 Lacinipolia stenotis is a small (FW length 11 - 14 mm) mottled white and gray moth with whitish filling of the forewing spots and posterior subterminal area and hindwing that is white in males and gray in females that flies in interior dry habitats during the fall. The forewing apex is elongate, coming to an acute apex. The ground color is light gray, moderately to heavily suffused with dark scales. The median area and costal antemedial and postmedial areas are darker medium gray, and the basal antemedial area and most of the subterminal area are light whitish gray, most prominently in the posterior subterminal area. The terminal area is gray with ill-defined dark gray wedge-shaped marks opposite the lower cell and in the fold. A few specimens have yellow scales in the median area, greatest distal to the claviform spot. A short black basal dash is present. The veins on the distal wing are dark. Females are usually darker than the males. The basal and antemedial lines are double, gray filled with the ground color, often partially absent. When visible, the antemedial line is excurved with teeth toward the base on the veins. The median line is dark gray, most consistently present on the costa. The postmedial line is similar to the other lines on the costa but is comprised of a thin toothed inner line bordered laterally by the white filling, sharply drawn toward the base on the costa, curved near the outer reniform spot and touching its lower edge, then nearly perpendicular to the posterior margin below the spot. The subterminal line is pale, evident on the costa and as the transition between dark and light in the subterminal and terminal areas elsewhere, preceded by dark lines or weak wedges between the veins on the mid wing. The terminal line is dark, thicker between the veins. The fringe is checkered gray. The orbicular and reniform spots are outlined in gray to black. The orbicular spot is round, filled with gray off-white with or without an ocellus. The renform spot is moderately large, broadly kidney-shaped or weakly hourglass-shaped, filled with similar color as the orbicular spot but often with less gray centrally. The claviform spot is small and black. 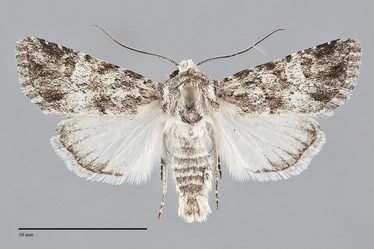 The hindwing is white in males and medium gray in females, with an ill-defined gray marginal band and gray veins toward the margin and a thin dark terminal line; females often have a small discal spot. The hindwing fringe is white in males; white with a gray base in females. The head and thorax are hoary medium to dark gray with thin black transverse line across the collar and edges on the tegulae. The eye is covered with fine hairs. The male antenna is bead-like. This species can be recognized by its mottled white and black pattern and late flight period. It is most likely to be confused with Lacinipolia strigicollis in our area. This species is more contrasting light ochre or light green and gray and has a much better-defined scalloped antemedial and postmedial lines than those of L. stenotis. This species is widely distributed in juniper woodlands and in dry, open sagebrush steppe at low to middle elevations east of the Cascades. It tends to be sporadic, but may be locally common. 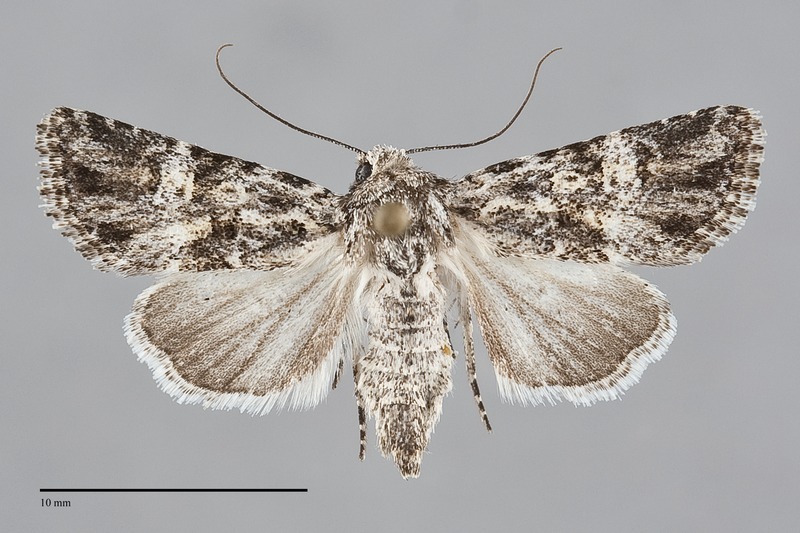 Lacinipolia stenotis is found in the dry interior of Washington and Oregon in our region. It probably occurs in southern Idaho, at least in the western part. This species is found in California and in the Intermountain region to the south of the Northwest. 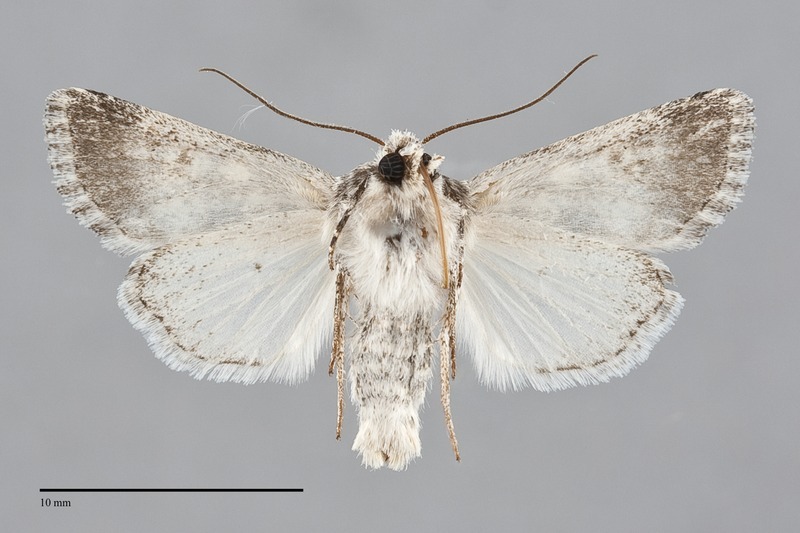 It is replaced by the similar species Lacinipolia vittula further east on the southern Great Plains. No information is presently available regarding larval foodplants of this species, but it probably feeds on herbaceous vegetation based upon related species. 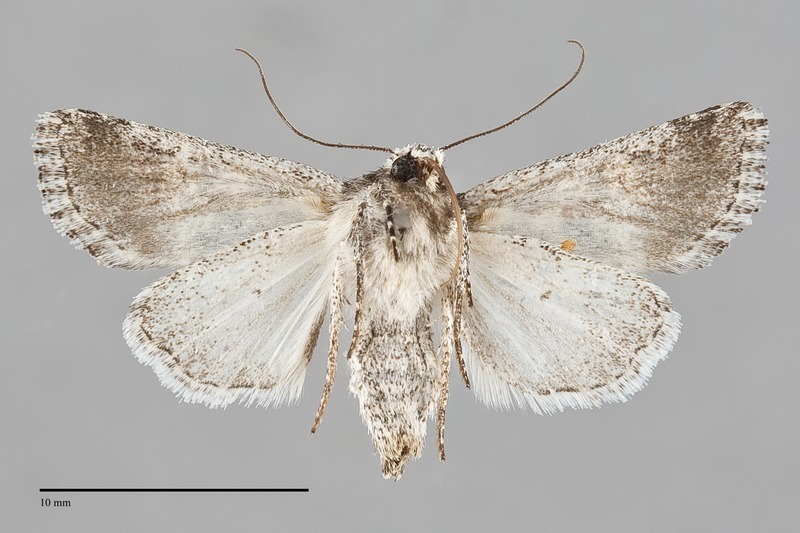 The flight season of L. stenotis is the fall, beginning in late August and lasting until early October. It is nocturnal and comes to lights.